We will feature product highlights from the Ammo product line as well as show off the new hardware from Rupes. Special discounts will be had on all products in stock at Detailer's Domain. Please sign up here for this event so we have a head count. ---> Sign up for this exciting FREE event! Ammo NYC - Larry Kosilla from AMMO NYC will be here to meet and greet fans of the /DRIVE CLEAN Youtube series, showcase the AMMO product line, and detail the AMMO 964 during the event. Ask questions, play with tools, and pick up a few AMMO products while your here! 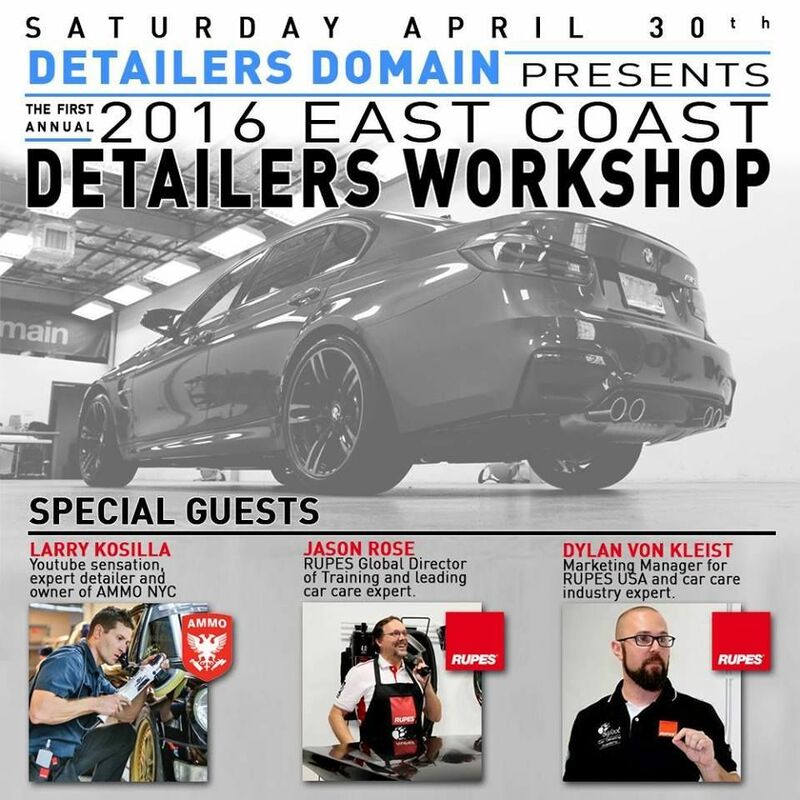 Rupes - Paint correction and machine polishing experts Jason Rose and Dylan von Kleist from RUPES will be on hand to showcase the entire RUPES BigFoot line including the industry leading Mark II polishers and the innovative new Bigfoot Nano with iBrid Technology. Learn the secrets to maximizing the BigFoot system, get hands on time with the tools, and see what makes RUPES the industry leading innovator for polishing and paint care. The product showcases will be conducted in a casual manner allowing everyone in attendance a chance to pose questions and get professional answers from the people who know the tools best. « Limited Time - 15% off @ DD - Spring is in the Air - Time to get those cars cleaned!